Definition at line 55 of file Builtins.h. Definition at line 56 of file Builtins.h. Referenced by clang::Builtin::Context::hasCustomTypechecking(), clang::Builtin::Context::isBuiltinFunc(), clang::Builtin::Context::isConst(), clang::Builtin::Context::isConstWithoutErrno(), clang::Builtin::Context::isHeaderDependentFunction(), clang::Builtin::Context::isLibFunction(), clang::Builtin::Context::isNoReturn(), clang::Builtin::Context::isNoThrow(), clang::Builtin::Context::isPredefinedLibFunction(), clang::Builtin::Context::isPredefinedRuntimeFunction(), clang::Builtin::Context::isPure(), clang::Builtin::Context::isReturnsTwice(), and clang::Builtin::Context::isUnevaluated(). Definition at line 58 of file Builtins.h. Definition at line 57 of file Builtins.h. 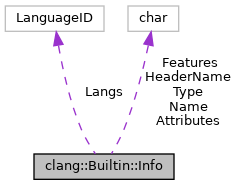 Referenced by clang::Builtin::Context::getAuxBuiltinID(), and clang::Builtin::Context::isBuiltinFunc().